Are you a busy lady? Raiding the lunch box stash to refuel? Snacking on unhealthy food on the go? Tired? Need an energy boost? 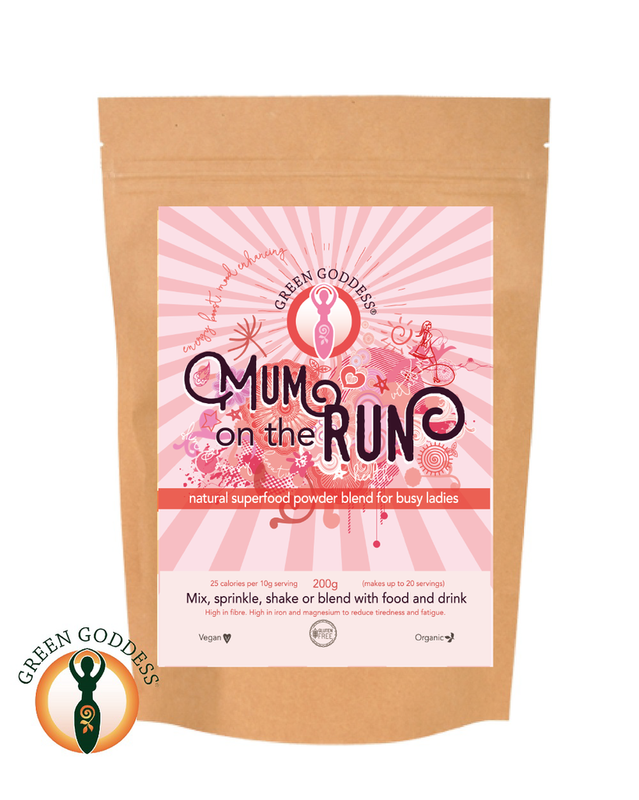 Green Goddess made Mum On The Run just for you. A blend of organic natural superfoods to nourish and refuel. Fill yourself up first. Some ideas.......Whisk with milk (almond, coconut and hemp are great). Mix with water. Sprinkle onto porridge, granola or mix with oats and milk overnight as a delicious bircher for the morning. Contains: Raw Organic Cacao Powder, Organic Lucuma, Raw Organic Banana Powder, Organic Maca Powder, Erythritol. High fibre foods help you feel fuller for longer. Can help with weight management and curb unhealthy snacking. High Iron contributes to normal cognitive function. Iron contributes to the normal function of the immune system.